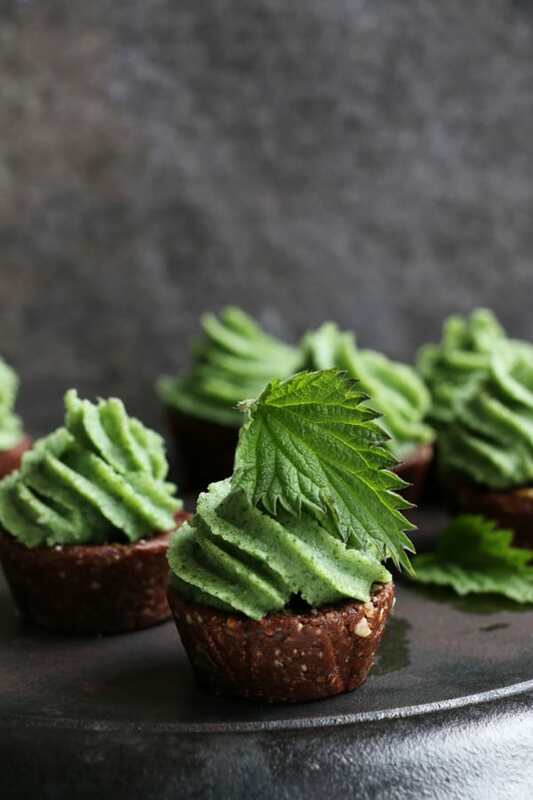 Ever since posting my Spring Nettle Soup recipe I’ve been thinking about making nettle frosting. 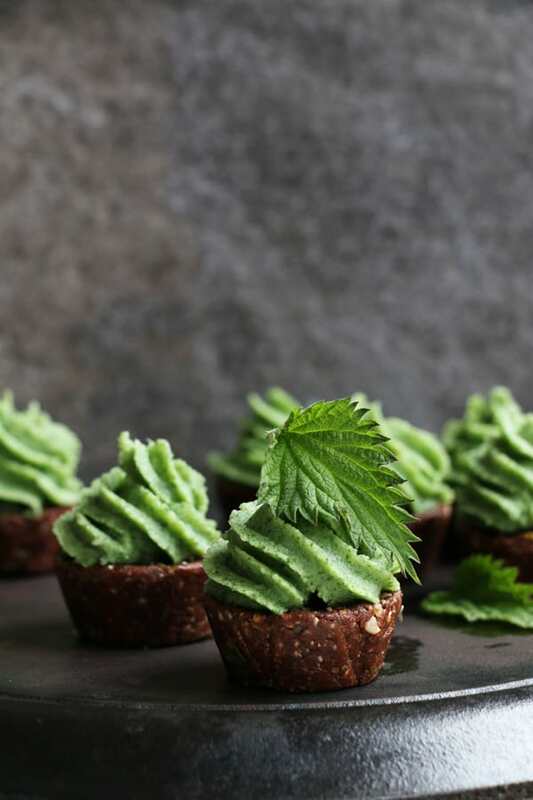 The vibrant green colour of nettles is just too beautiful not to try! 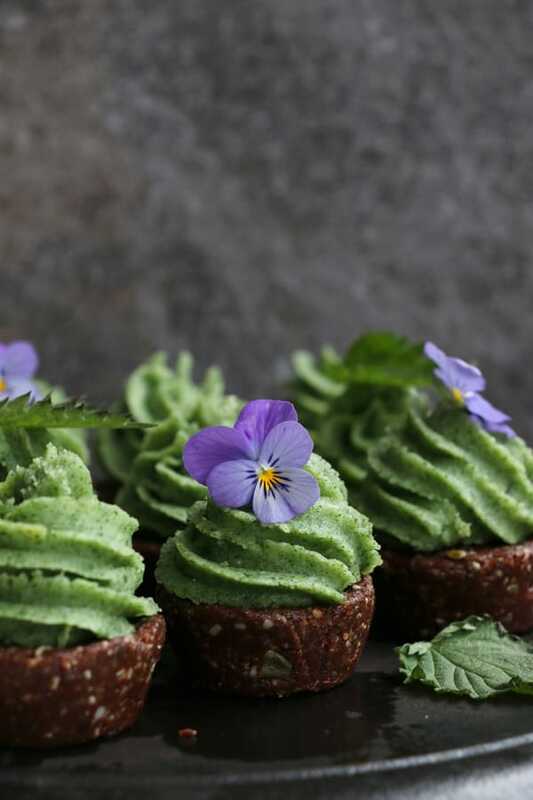 And so these Raw Chocolate Cupcakes with Nettle Frosting came to Life as a complete experiment and I totally fell in love with these gorgeous mini cakes. 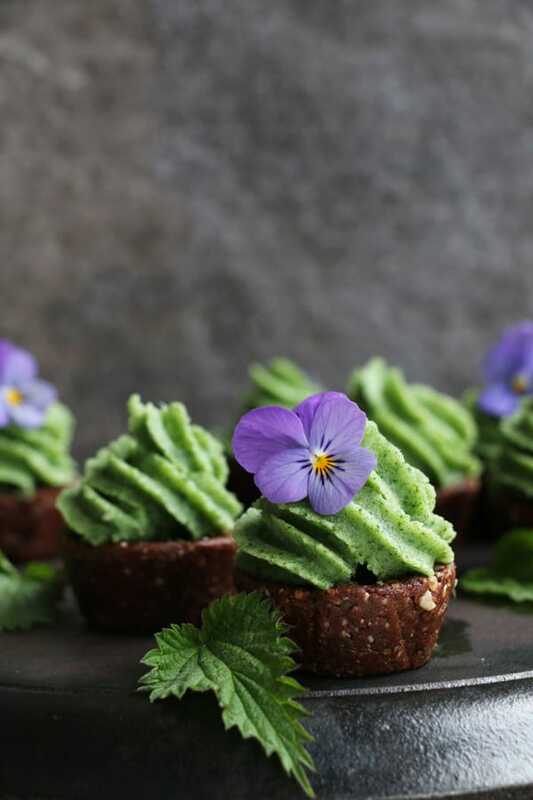 I’ve picked the nettle chocolate combination for the colour, not really knowing whether it would work, but the flavours! What a yummy wholesome treat these are. Place the walnuts and pumpkin seeds into food processor, pulse few times until they broken down to a coarse consistency. Add dates, coconut oil, cacao, cinnamon and sea salt and blend until the mixture comes together. Divide the mix evenly into 12 mini cupcake holes and press tightly down. Place into a fridge for about an hour to firm up. In a double boiler gently melt coconut butter with coconut oil. Set aside and leave to cool down a bit. Carefully pick nettle leaves from the stems and wash thoroughly. It's best to use gloves to do that. In a small pot bring water to a boil, add nettles and boil for 2 minutes. Rinse under cold water and drain well. Place into blender with 1tbsp of lemon juice and blend until smooth. Add the melted coconut butter, maple syrup and lemon zest to the nettles and blend until incorporated. Scoop the mix into a bowl and refrigerate for about half hour until firm enough to frost the cupcakes. Don't worry if it looks a bit split at this point, just give it a good stir afterwards. With an edge of a knife pop the cupcakes out of the tin, smooth out the edge if it gets a bit distorted. Spoon the mixture into piping bag with a large nozzle and decorate the cupcakes. Store in a fridge or freezer in an airtight container. There’s a sweet spot for the frosting, don’t let it cool too long, otherwise it’ll be too hard to frost the cupcakes. If it does get too hard, you can soften it in a double boiler. Where do you get the nettle leaves from? Hi Ana, I get nettle from my local Farmers market and they are just back in season. If you live in countryside, nettle grows wild pretty much anywhere. What a great idea! And the photos are wonderful too! Can’t wait to try these! Beautiful! Wondering if I could substitute raw honey for the maple syrup??? Hi can I just know what is coconut (1 cup) and what is coconut creamed? Hi Amra, I’ve used coconut butter in the recipe, which is the same thing as creamed coconut, they just come in different packaging. Sometimes it’s also referred to as coconut manna. You can make your own by blending shredded coconut too. Thank you very much for this beautiful recipe. I live in Southern Spain and have no idea where I could find 30 grams of fresh Nettle leaves. Due to the strong influence of Moroccan cuisine here, there is an abundance of fresh mint. Do you think I could substitute the nettle leaves for fresh mint? Would dried nettle leaves work in place of fresh? Hi Hannah, I don’t think dried nettles would work in here, fresh nettles have lovely vibrant green colour that is perfect for these. 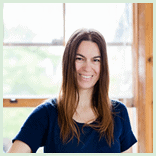 You could try spinach or a green powder like matcha or wheatgrass could also work. They look so yummy & picturesque! 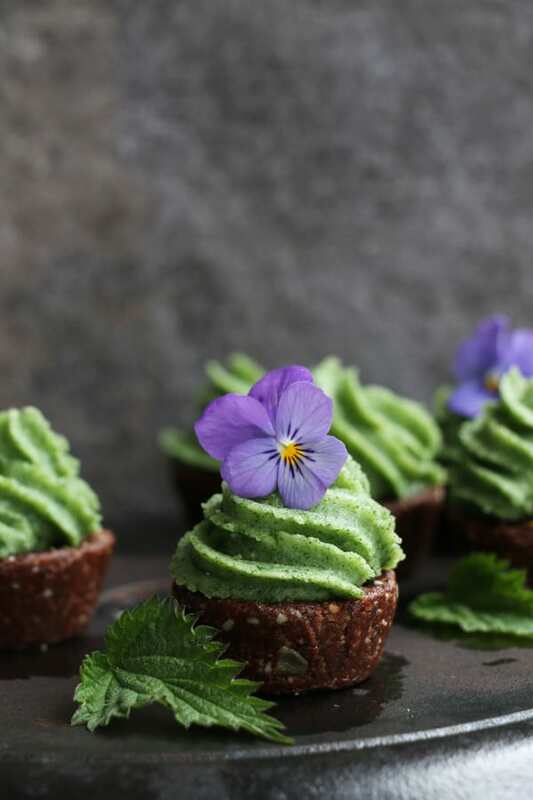 Since nettles arent available at the moment I am thinking maybe a bit of Peppermint Essential Oil in the frosting & a bit of freshly ground up mint from my garden for that beautiful color of green. Hi Mandy, I’m not sure if they would as I haven’t tried. The fresh nettles are great for the bright colour, which will be difficult to achieve with dried ones, however you could always try :) They won’t get too soggy with the fresh ones as the coconut butter is so solid, it needs something to thin it out. Nettle lasagna sounds amazing! Wonderful idea! I wonder how to substitute a coconut butter? Thank you Michalina! You could use a mix of soaked cashews and coconut oil instead. 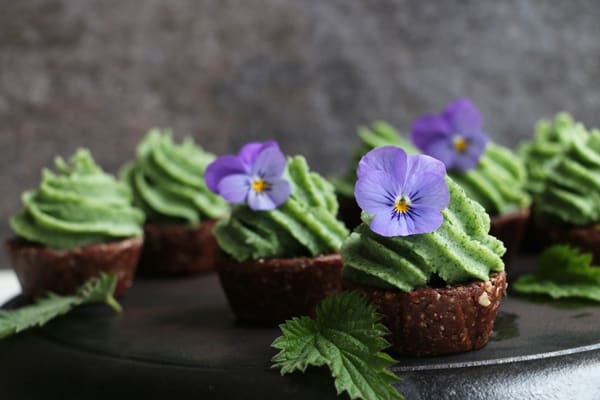 This recipe sounds delicious, do you think it could be done as a tart ? How long would you leave it in the fridge to set ? Tried and love the nettle soup recipe !